House Democrats pressed for a vote Thursday on a revised children's health proposal despite President Bush's renewed veto threat and Republicans' warnings that the changes may not attract more supporters. The White House said Thursday that Bush will veto the bill if it reaches him because it does too little to enroll low-income families ahead of those slightly better off, and because it includes a tax hike -- in this case, on tobacco. The House last week narrowly failed to override Bush's veto of a similar bill to add $35 billion to the State Children's Health Insurance Program. Democrats said the modest changes to the bill should be enough to attract about a dozen more House Republicans, which would provide a veto-proof margin. But leaders of both parties said they were unsure that would happen. As before, the bill would add would $35 billion over five years to the program, aimed at families that do not qualify for Medicaid but are too poor to afford medical insurance. The program, which now covers 6 million children, would enroll 4 million more. The increase would be paid for with a 61-cent increase in the federal excise tax on a pack of cigarettes. Health and Human Services Secretary Mike Leavitt says lawmakers have not justified the need for a $35 billion expansion to cover 10 million children. The White House's veto statement said some states might enroll families earning more than three times the poverty rate "by ignoring part of the family's income." Democrats and their GOP allies are targeting 38 House Republicans who voted to sustain Bush's veto and later outlined their concerns in a letter. 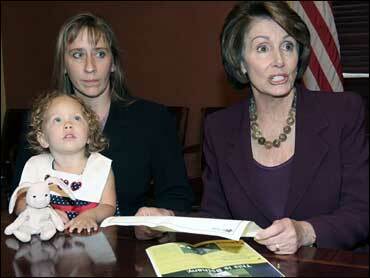 The revised bill addresses those concerns, said House Speaker Nancy Pelosi, D-Calif. But Republicans were angry that Pelosi insisted on a vote Thursday, rather than giving lawmakers more time to study the bill and seek GOP converts. "Bringing the bill up today, with no time to even read it, is either a terrible mistake or an intentional partisan maneuver," said Rep. Heather Wilson, R-N.M., who supported the vetoed bill. "I think it will fail to garner the two-thirds majority." Pelosi said the House needs to act this week "because this fits into our legislative calendar." If Republicans support the health program's expansion, she said, "they won't be looking for an excuse to oppose this bill." Democrats said Thursday's vote is important, but not the crucial test, because both parties agree the bill will easily receive a simple majority. If Bush vetoes the measure, after House and Senate passage, the showdown will occur when its supporters again seek the two-thirds House majority needed for an override. But Wilson and others said Republicans will be loathe to vote against Bush on the override question if they voted against the bill this week, regardless of the reasons for their votes. A veto-proof margin in the Senate is considered assured. On Oct. 18 the House voted 273-156 to override Bush's veto, 13 votes short of a two-thirds majority. Forty-four Republicans joined 229 Democrats in voting to override.